Is there a way to withdraw a notice of departure? ICOTS doesn't show the withdraw button. The offender didn't leave and receiving state doesn't want to do the arrival notice. Some compact activities like departure notices and arrival notices can't be deleted or withdrawn once submitted to the other state. The reason is once those activities are submitted, they are instantly received by the other state. 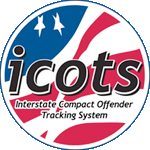 As a training note and to effectuate the tracking component of ICOTS, the NOD should be sent on the date (or as close to the date as possible) that the offender actually departs your state. The same applies for the arrival notice. In managing a case where an NOD or NOA was submitted too early, the national office recommends communicating further with the other state on the offender's departure via CAR so all information on the location of the offender is captured in ICOTS. If the offender is never going to arrive in the receiving state, then the entire compact case needs to be withdrawn or closed depending on the activity.